Pepe Fanjul, Jr. and his family have been recognized by the Western Palm Beach County Farm Bureau as the Everglades Agricultural Area (EAA) 2016 Farm Family of the Year. 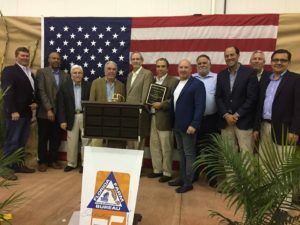 The award was presented on November 9 by John L. Hundley, Chairman of the Board of the Sugar Cane Growers Cooperative of Florida, at Ray’s Heritage Packing House in Belle Glade. The award is given to farm families who exhibit excellence in their commitment to agriculture and civic engagement in the Glades region of western Palm Beach County, where the Fanjul family has been farming since 1960. The family’s companies, Fanjul Corp. and Florida Crystals Corporation, produce sugarcane, rice and sweetcorn, throughout the Everglades Agricultural Area, which is one of the world’s most productive and sustainable agricultural basins. In addition to providing thousands of jobs for EAA farmers, the Fanjul family has been an integral part of the community for decades through their charitable support, particularly their efforts to improve access to high-quality education and to reduce hunger. For instance, the Fanjul family founded New Hope Charities, a grassroots nonprofit that provides services for children and families in western Palm Beach County ranging from daycare and health care to food distribution. The Fanjul family also founded two charter schools in Pahokee, Everglades Preparatory Academy and Glades Academy, to increase educational opportunities for families in the Glades. 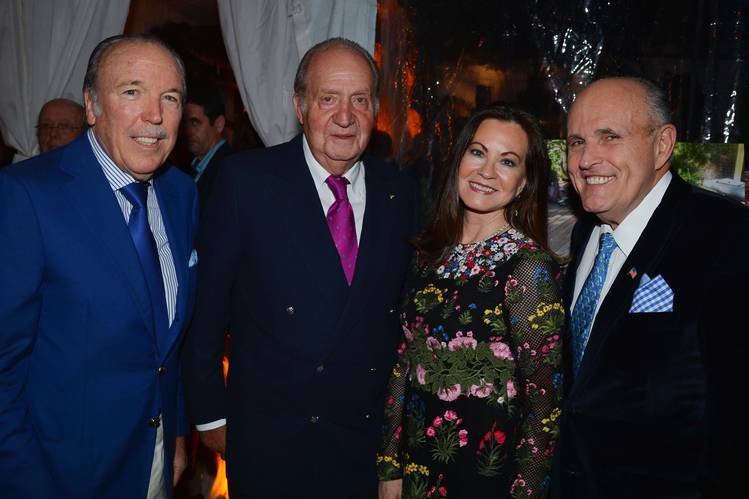 The fundraiser supports two charter schools that were founded by Emilia Fanjul. Everglades Preparatory Academy is a charter high school in Pahokee, Florida, and Glades Academy is a charter elementary-middle school, also in Pahokee. Emilia Fanjul serves as chairwoman of the board of directors of both schools and has a passion for helping the children in western Palm Beach County. Mrs. Fanjul told the Wall Street Journal of the schools’ focus on the children, “we mentor them, we nurture them and we educate them.” Read more here. Spanish-language magazine’s annual Icon of Style Awards. Glades Academy elementary school — in Pahokee. passion and helping the children in the communities excel. Crystals Corporation, donated the land where the new school was built. Nacho Figueras, musician Ruben Blades; and artist Ruben Toledo. Florida Crystals’ executives Pepe Fanjul, Pepe Fanjul, Jr. and Alfonso Fanjul pay a visit to the Osceola Sugar Mill in Pahokee, Florida. Pepe Fanjul sends out his deepest congratulations to Glades Academy’s school children, teachers, administrators and board members for the tremendous work they did to achieve the charter school’s first A rating. Pepe Fanjul also recognizes the amazing effort that went into achieving Adequate Yearly Progress for the second consecutive year, as well as in three of the past four school years. Pepe Fanjul has been closely involved in the school for 10 years. Glades Academy Elementary charter school was founded by Pepe’s wife Emilia Fanjul in 2001 to offer children and parents in the rural communities of western Palm Beach County a wider range of school choice and options for education. Emilia Fanjul serves as chairwoman of the board of the Pahokee school. The results of the 2010 – 2011 school year show that Glades Academy Elementary school is excelling at both the state and federal levels. The rating system is part of the state of Florida’s A+ Plan, while Adequate Yearly Progress, or AYP, is part of the federal No Child Left Behind Act. Glades Academy was also the highest rated elementary school in the communities of western Palm Beach County. Pepe Fanjul and Emilia Fanjul have been large sponsors of the school since it was established. They are contributors at the school’s annual benefits, which are also hosted by Emilia. Florida Crystals Corporation (of which Pepe Fanjul is vice chairman of the board, chief operating officer and president) also donated the land where Glades Academy built its brand new school. The school will open this coming school year (2011 – 2012) and is equipped with state-of-the-art technology, including internet access in all the classrooms and interactive board that will assist students by allowing them to take advantage of the latest educational tools. The Fanjul family and their company, Florida Crystals Corporation, will give another annual donation of $10,000 to Liga Contra el Cancer (League Against Cancer) during the non-profit’s signature 2011 fund raising drive. Florida Crystals’ contribution will be presented at the non-profits well-known annual telethon on June 5, 2011 at the Miami-Dade Fair Expo Center. The telethon, which the charity says is the cornerstone of their annual fund raising drive, broadcasts from 5 p.m. to midnight and features singers, actors, bands and check presentations. For the 11th year, the popular Spanish-language television station Telemundo will give seven hours of prime time, which will mean Liga Contra el Cancer will reach more than half a million households. Liga Contra el Cancer was founded in Miami in 1975 as a community-based, not-for-profit organization providing free medical care to Cancer patients in need. More than 350 board-certifiedphysiciansvolunteer their services to the not-for-profit organization. Florida Crystals Corporation has been an active member of South Florida’s community since 1960. The Palm Beach-based sugar producer celebrates its 50th anniversary this year. Starting from humble beginnings, the company has grown with its subsidiary, American Sugar Refining, the world’s largest sugar refining company, to be a global producer of sugar. Florida Crystals Corporation is led by Alfonso Fanjul and J. Pepe Fanjul.